Preclinical models for musculoskeletal disorders are important for understanding the pathogenesis of bone and joint disorders in humans and to develop effective therapies. 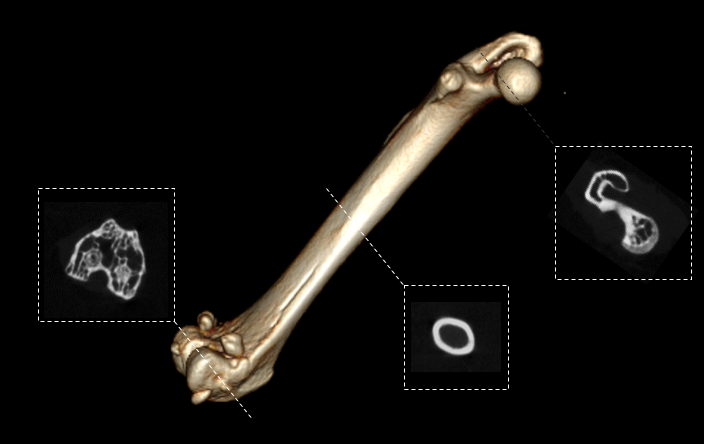 In vivo bone imaging studies on the X-CUBE allow the researcher to evaluate specific bones longitudinally in a non-invasive manner. The image shown below displays a mouse femur. Postprocessing software can be used to calculate BV/TV, cortical thickness and surface area, among others.